This formal living home is ideal for 4 to 5 adult couples or a large family wishing quality time in an upscale environment. Faux paints and papers, marble & tile throughout, this is not a typical Lake of the Ozarks lake home. Premium linens throughout and the finest mattresses (including 1 Tempur-pedic). Level entrance to upper bedroom level bedrooms and medium slope sidewalk to main living level with kitchen, living areas and formal master suite to die for! You are nearly handicap accessible. Upper and lower decks overlooking great channel views with cove protection for the private single well dock. Relax at the Martini deck lakeside or swim from the dock. Separate dining deck adds to the comfort. Sleeping in the latest in comfort: Two king beds, and 2 queen beds feature Beauty Rest mattresses. The 5th bed room has a new Tempur-pedic mattress and a twin bed to add flexibility. A porta-crib, high chair and a modern full sized roll-away bed add to the convenience. The romantic master suite on main living level with beautiful platform bed, indirect lighting, ceiling fans, private jetted tub, and shower. Enjoy four miles of lake views while lingering in bed. Great roads and perfect location on the lake and by road make this your perfect private retreat for your family or loved ones this summer. Early June or late August provide the best, in season values. Hi, my name is Henry. My mother and I find working on our lake homes a great family project. She is constantly working to upgrade guest comfort. We are certain you will be happy with the many smaller (and larger) details that will make your vacation most memorable. The fully equipped kitchens include an ice maker and bread machines. I choose this home for the more Florida Feel and fabulous views down the channel while providing a protected dock for the boat. The 5 bedrooms afforded more private space. And the huge master with 4 headed shower and private jetted tub provides for a romantic oasis away from the bustle of a busy lake weekend. I love sitting on the covered lanai watching the lake activity passing me by. By boat I am minutes away from great venues. On land, its close to golf, movies and only 35 minutes to the outlet mall and amenities of the Osage Beach area. A new 45000 sq ft grocery openned Memorial Day 2013. There is a great petting zoo, The National Shrine to Mary, great hiking, caves, wineries, shopping and golf are all close by. Available for rent with delivery to the dock. Starting at $385 per day. They also rent jet skis. They will bring the boat to you. Very beautiful house with gorgeous view. We loved our vacation spent there!!! Three generations of my family enjoyed this lovely lake house for a week. Situated on a bit quieter spot on the lake in a small bay it was ideal for the children to swim and fish off the dock. The house was spacious with a lovely view of the lake. It had lots of dishes, china, silver, pots and pans for us to cook. The beds and bedding were first class. Gary and Debbie brought the boats we rented and picked them up. Bob was available for any issue we might have had. Henry even provided a charcoal grill for our use even though a new gas grill was available. 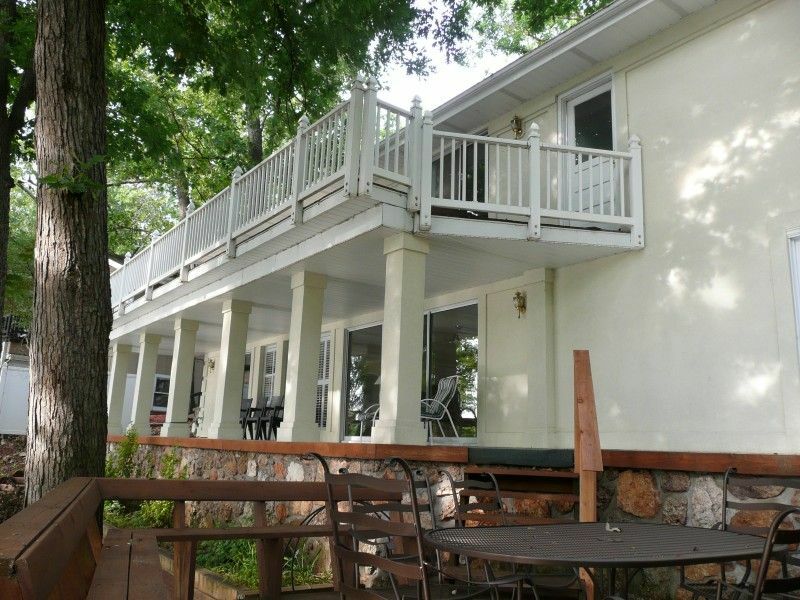 I can recommend this property and will certainly use it next time I'm at Lake of the Ozarks. The home was close to what was shown on VRBO. The home needs some updating such as painting and there is some mold in the bathrooms. Even though it states no children because of no rail on lower deck I think some kind of railing would be in order. All in all it was a nice home and fairly close to everything we wanted to do. Thanks for your comments. I want to assure all guests there is no mold anywhere in this home......perhaps a bit of mildew is what you saw, as is frequently the case in a warm wet space during summer months at a lake house. Our cleaning team is impeccable, so we're sorry that this mildew inconvenienced you. As for home updating? As the homeowner, it's a constant and ongoing project. All is spiffy and ready for 2014 guests. Come on down this season for an exceptional lakefront vacation rental experience! Our thanks. Thanks to Henry for our wonderful weekend, this house is very spacious. There were three families and plenty of room for all. This house has all the amenities of home. The view of the lake is spectacular from either the lower or upper decks.Gary and Debbie from Lake Toon Rentals also very accomendating.3Not only did they drop off and pick up the boat, they allowed us to keep overnight. Thanks again, we had such a memorable weekend.we defiantly be going back. We had a wonderful time. The only thing that needs to be checked would be the dryer. It had a hard time drying the towels. Golf Course and movie theater 2 miles away. Childrens petting zoo and The National Shrine to Mary is near Laurie Missouri, 6 miles away. Woods grocery store with 45,000 plus square feet openned Memorial Day, 2013. Fireworks viewable from the deck dining room table on Holiday Weekends. The outlet mall, caves, wineries and hiking trails are within 40 minutes. There is a pet fee per night of $30. VRBO does not add this per night. You will be charge separately* Summer Holiday Weekends require a 4 day minimum. **Fall and Winter Holidays require a 3 day minimum stay. Winter Holiday weekends have a flat add-on fee of $200, in addition to nightly, extra person, cleaning fees and taxes.